A year ago, in October 2016, Patrick McCarthy, president of the Annie E. Casey Foundation, Miriam Shark, former associate director at Casey and I took an exhaustive look at the evidence surrounding America’s use of large, congregate care facilities – sometimes called youth centers, training schools or juvenile correctional facilities – but what we called “youth prisons” due to their similarity to their older cousin: the adult prison. Then we looked at innovations taking place around the country, spurred on by increasingly sophisticated advocacy and open minded and creative policy makers and policy implementers like those of you in this room. We concluded that large, distant and correctional youth prisons should be abolished as a construct in the landscape of American juvenile justice, and should be replaced by a rigorous continuum of in-home services, supports and opportunities for youth. Moreover, we concluded that, when young people need to be deprived of their liberty, it should be done in small, rehabilitative programs close to their homes and home communities— and for only as long as is needed to meet the ends of justice, public safety, and rehabilitation. It’s long past time, in other words, to change the paradigm that has determined how the justice system deals with youth since the 1800s, when America’s first youth prisons were launched. During the 1800s, massive immigration and urbanization flooded our cities with unprecedented numbers of families from Ireland and Eastern Europe and from economically impoverished rural communities. Civic leaders of the time, dismayed by groups of adolescents (many of them the children of immigrants) running the streets unsupervised while their parents worked long hours in sweat shops and factories, believed that such youths needed to be “Americanized” and rehabilitated. Their prescription was to send young people out of crime-producing cities to rural reformatories where they could work hard on farms, presumably learn good Christian values and return home better than when they left. This model was a disaster from the start, characterized by physical abuse, whippings, sexual assaults, and economic opportunism like lend leasing youth under harsh conditions. In many ways, the abuses endemic to early youth institutions are not dissimilar to what we see today. Over the past century, while the young people have changed, the “remedy” hasn’t. In the 1980s and 1990s, when a rise in violent youth and adult crime caused deep concern about whether the juvenile justice system was itself warranted and if so, whether it was too lenient, catch phrases like “if you do the adult crime you should do the adult crime” appeared in the media. The notion of “superpredators” stereotyped far too many young people as violent and irredeemable, causing legislators in every state to increase the ease with which young people were tried as adults, erode confidentiality protections, or both. Youth confinement peaked in 1999 at 109,000 youth nationally. This backlash against the juvenile justice system was existential, questioning its very foundation. The demise of the juvenile court system itself was openly discussed. This too, caused a backlash, some of which was led by advocates and elected officials and some by researchers examining some fundamental questions about the nature and impact of juvenile justice and placing youth into the adult criminal justice system, along with whether kids were really different enough from adults to warrant the juvenile system’s special treatment. On that second point, it turns out they are. Increasingly sophisticated research in developmental psychology and neurobiology funded by entities like the MacArthur Foundation and the Justice Department revealed that young people are less future oriented, more susceptible to peer influence, more volatile in emotionally charged settings and greater risk takers, particularly in the presence of peers. Research supports what the founders of the juvenile court (and most parents) suspected all along: that youth aren’t just smaller versions of adults, but that they’re different in important respects that both mitigate their blameworthiness and offer us opportunities to steer them onto a better path. What does this developmental research tell us youth need to get back onto the right track? activities that contribute to developing decision-making and critical thinking skills. Meaningful jobs, a stable marriage and participation in the military have been shown to be important bridges out of adolescent offending and into a stable, law abiding adult life. But all of those are less likely for adolescents today than they were in previous generations, particularly for youth of color who grow up in impoverished neighborhoods. Our research found a dismal record of achievement for these institutions that are wrapped in the rubric of rehabilitation. Despite the zeal of their designers and earnest efforts by some administrators, these facilities designed to rehabilitate and care for their charges do anything but. The Annie E. Casey Foundation chronicled cases of systemic abuse of youth in facilities in all but five U.S. States and the District of Columbia from 1970 to 2015. A 2008 Associated Press report revealed 13,000 allegations of abuse by staff against youth in facilities holding 46,000 youth, and my experience with such youth is that they most often underreport incidents of abuse. In 2012, the Bureau of Justice Statistics conducted a sophisticated and comprehensive survey of youth in the custody of America’s youth prisons and found that one in eight reported being sexually assaulted by staff or other youth in the facility in the year preceding the survey. Far from being an anomaly, abusive conditions in America’s youth prisons were the norm. What I witnessed during my time running the Washington, DC Department of Youth Rehabilitation Services was nothing short of scandalous. Staff regularly beat and humiliated young people, sometimes locking them in their cells naked to reinforce their humiliation. Drugs – sold to the youth by staff – were so prevalent in my facility that youth who came into confinement free of drugs were testing positive after a month in custody. Staff were sexually assaulting the youth and even sexually pressuring their fellow new staff recruits. I often said I wouldn’t kennel my dog in the benign-sounding Oak Hill Youth Correctional Facility, never mind entrust it to a young person whose life I cared about. The physical plant was so decrepit that youth complained and showed signs that rats and insects were crawling on them and biting them at night. I often said I wouldn’t kennel my dog in the benign-sounding Oak Hill Youth Correctional Facility, never mind entrust it to a young person whose life I cared about. The closure of that nightmare facility continues to be my proudest professional achievement. So, while young people need caring adults, positive peers, opportunities to make good decisions, chances to achieve educationally and, upon release, pathways to marriage and employment, youth institutions chronically provide them with abuse, neglect, and worsening life opportunities. Compared to similarly situated youth, young people who experience America’s youth prisons are more likely to be rearrested, have worse employment and educational outcomes, and are more prone to mental illness. These opportunities are not meted out equally across all populations. As Eastern European and Irish youth filled our youth prison beds upon their opening, African American and Latino youth are now their principal occupants. The research we examined showed that two-thirds of sophisticated studies comparing similarly situated youth of different races and ethnicities showed “race effects” – racially disparate treatment unaccounted for by offense severity or prior record – at one or more stage of the juvenile justice system. One study revealed that probation officers were more likely to ascribe the delinquent behavior of black youth to internal forces, whereas delinquency by white youth was more likely to be viewed as being caused by external forces beyond the young person’s control. The result was more punitive recommendations for black youth, even controlling for prior record and current offense. That’s why we recommended eliminating youth prisons. What Can Take the Place of the Youth Prison? In their place, we have suggested creating a robust continuum of community based programs that endeavor to provide the exact elements research is telling us youth need to thrive and desist from delinquency – supportive opportunities to engage in critical thinking and decision making, positive adults and peers, educational advancement and work opportunities. There is plenty of good news in this arena over nearly the past two decades. From 2001-2013, there has been a 53% decline in youth incarceration in the U.S. During that time, two-thirds of the facilities incarcerating over 200 kids have closed. We chronicled several jurisdictions that have almost completely stopped using large youth prisons. The Missouri Division of Youth Services has famously eschewed youth prisons for decades in favor of a network of small, homelike and rehabilitative youth facilities of 20 to 40 youth, generally located no further than 45 minutes from population centers, often closer. New York City has almost completely eliminated the use of youth imprisonment for young people tried in its family courts. Now, nearly all delinquent youth from New York City either remain home in a robust continuum of care, or if they are confined, are housed in small facilities within or near the five boroughs that are rich in programming and with high staff to youth ratios. Since the city went in this direction, youth arrests have continued to plummet. New York and Missouri are hardly the only jurisdictions moving away from the youth prison model. After the media revealed ritualistic sexual abuse in its youth prisons in 2006, the Texas legislature acted decisively by significantly reducing the pipeline into youth prisons and truncating lengths of stay. These mechanisms helped reduce the population by two-thirds (2,800 youth) allowing the state to close 8 youth prisons and save $150 million. Some $50 million of those savings were returned to counties to encourage them to program youth locally rather than send them to state facilities. From 2007-2013, youth arrests in Texas fell by 49%. In the early 1990’s, Ohio’s youth prisons were overcrowded at nearly double their rated capacity. As in many states, the fiscal incentives for youth incarceration were backwards, county judges could incarcerate youth in state facilities at no cost to their counties, but if they wanted to keep them at home with services, the county had to foot the bill. In 1992, Ohio legislators flipped that script by incentivizing counties to retain appropriate youth locally. RECLAIM (Reasonable and Equitable Community and Local Alternatives to the Incarceration of Minors) Ohio, as the new law was dubbed, resulted in an immediate reduction in county commitments to state youth prisons in five initial pilot counties while the rest of the counties in the state continue to increase commitments. Since it went statewide, RECLAIM has been associated with an 80% decline in youth incarceration in Ohio from 2500 to 500 youth. Was this a jail break? Did releasing four out of five youth from confinement in Ohio result in a surge in youth crime? As with Texas, the answer is an emphatic no. From 1997 to 2013, there was a 47% decline in youth confinement in Ohio and a 65% decline in youth arrests. From 1997 to 2013, there was a 47% decline in youth confinement in Ohio and a 65% decline in youth arrests. Meanwhile, in the same state at the same time, there was an 8% increase in adult confinement and a more modest 32% decline in adult arrests. So, while Ohio was cutting its juvenile incarceration numbers in half and increasing adult incarceration, it got twice the decline in youth arrests as in adult arrests. Do the Texas and Ohio stories prove that reducing youth imprisonment causes less youth crime? The research is not sophisticated enough to bear that conclusion. But since youth (and adult) incarceration mushroomed on the premise that it was needed to keep us safe, these substantial declines in youth imprisonment do not support the notion that America’s massive experiment with youth imprisonment was or is warranted. It seems the less justified the status quo is, the harder it resists change. One note of caution: Youth correctional facilities, the staff in them, and the communities they support, fiercely resist closure. Even a rotten status quo fights back; indeed, sometimes it seems the less justified the status quo is, the harder it resists change. As youth incarceration declines, it can lead to skyrocketing per-youth costs as staff reductions and facility closures fail to keep up with the decline in incarcerated youth. 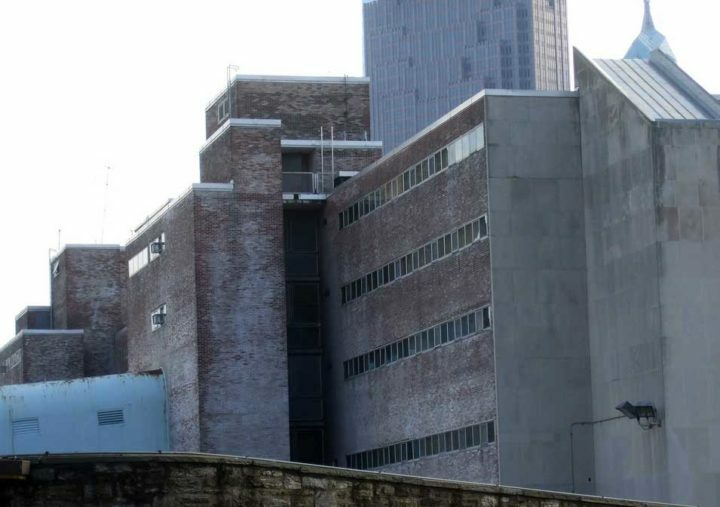 Connecticut’s sole remaining youth prison, the 250-cell Connecticut Juvenile Training School, had a $53 million annual budget with only 43 boys remaining in it in 2015. As youth crime declined in California and the state legislature passed a series of laws to reduce youth incarceration, the number of confined youth dropped from nearly 10,000 in 1996 to around 1,700 by 2008. During that time, the cost of incarceration in the state’s youth prisons rose almost sevenfold, from $36,000 per youth per year to $252,000. California policymakers learned their lesson and, effective in 2008, banned commitments for all but the most serious juvenile offenders to state institutions, closing eight of its 11 large youth corrections facilities by 2012. 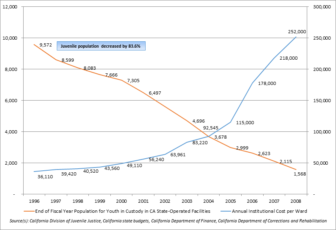 California’s state-incarcerated youth population plummeted to just 600 inmates by 2013; during which time, per-capita costs also declined, but then leveled out in order to support improved programming for those remaining in custody. JUVENILE INCARCERATION AND COSTS (California) Blue line shows costs per youth per year up sevenfold. Table provided by the author. Rather than take half measures, it is time to eradicate the youth prison model from the landscape of American juvenile justice. Its consistently poor record of providing rehabilitation, or even safe and constitutional conditions, for young people is well-chronicled. Its adult prison-like design does not match what science and experience suggest young people need to turn their lives around. Seldom have science, crime rates and politics aligned as they are lining up now in the juvenile justice arena. Red and blue jurisdictions around the country are successfully experimenting with approaches that eschew youth prisons in favor of robust in-home programming and small, safe and decent secure facilities close to youths’ homes. It’s time for more to join in, and replace these factories of failure with pathways to success for these young people. This is an abridged and slightly edited version of remarks made by former Washington, D.C. juvenile corrections director and New York City probation commissioner Vincent Schiraldi on Monday to the National Council of State Legislators. Schiraldi and his colleague Bruce Western will launch The Justice Lab at Columbia University this fall. Schiraldi welcomes comments by readers. Kovner, J. (2016). “State Begins Search for New Juvenile Jail Location.” The Hartford Courant. Nearly 400,000 young people are put on probation each year, pulling them deeper into the justice system without support or guidance that could divert them to a better path. Introducing a new report by the Annie E. Casey Foundation, two juvenile justice experts suggest an agenda to get them there. I need your help to stop an on-going Genocide in the US. In 1962, when I was 17, my father and the local cops in Belleville, Illinois, were freaked out because I had the IQ of Einstein, and so they wanted me OUT OF THERE PRONTO, even though I never broke any laws. So I joined the Navy at 17, and immediately started training as a Naval Air Nuclear Bombing Technician. After my Honorable Discharge, I took a night-job as a Guard in Stateville Penitentiary, the highest security prison in Illinois. On the day shift, I read electric meters. After a year, I used my savings to go to Shimer College and then Oxford University. But I found the colleges and universities to be so stupid, I dropped out just before graduation, and became a self-employed businessman — now a Multi-Millionaire. 87 years, times 150,000 deaths per annum, is 13,050,000 deaths caused by this Genocide — and that’s not even counting the rise in population since 1930. That’s more than TWICE the Holocaust! Now I run the Magnesium For Health Foundation, and the Magnesium Online Library of medical journals at http://www.MgWater.com, and I have financially supported many magnesium researchers around the world, with income from my Adobe Springs, which contain 110 mg of Magnesium per Liter, and is bottled by Crystal Geyser (the largest bottler in North America) as their “mineral water”, using 12 Million gallons of my water last year. But (PRIVATELY TO YOU) they won’t say a word about magnesium, as 99% of their products are Mg-deficient. Modesto 7-Up also bottles my Adobe Springs water, as “Noah’s Spring Water”, and advertises the Mg, but they are a small outfit. We need President Trump, and California Governor Brown, to speak out about Mg-in-water (which is more bio-available than Mg in food or pill). Due to soil-exhaustion, nearly all Americans are magnesium-deficient, which not only causes heart attacks and strokes, but also causes, migraines, cramps, and myriad other illnesses. I have spent many tens-of-thousands of dollars, reaching out to Trump and Brown, but neither one has said a word about Mg or Mg-in-water. I still have 50,000,000 gallons per annum going to waste, running from my spring down the creek and evaporating. That water could prevent one fatal heart attack about every 12 hours. I helped subsidize famous Magnesium Researchers Dr. Bella Altura and Dr. Burton Altura to write a medical journal article which was published by the UN’s World Health Organization (linked from the Home Page of my Magnesium Online Library, http://www.MgWater.com) which recommended that ALL drinking water on earth contain at LEAST 25-50 mg of magnesium per liter. I also subsidized the research by famous Dr. Andrea Rosanoff, whose medical journal article pointed out that current Global Deaths per annum from Magnesium-Deficient drinking water are 4.5 Million deaths per annum (also linked from my Library). Then I pointed out that over the next century, that would be 450 Million lives lost to magnesium-deficient drinking water, and that from 1917 to 2017, there were only about 200 Million lives lost to WAR. Thus Magnesium-Deficient Drinking Water is more than 2.2 times worse than WAR. Are you willing to speak out, to stop this American Genocide and Cover-up? Can I give you a tour of the majestic Adobe Springs, whose current sales are saving one life every 3 days? My staff can pick you up from any airport in the San Francisco Bay Area, and we can provide fine hotel and food accommodations. If needed, I can also pay your air-fare from anywhere in the US (though most of my money goes to magnesium researchers). I forgot to mention that the reason I am reaching out to you, is that I am impressed by your Integrity and efforts to help juvenile delinquents. Thus, I think you are MUCH more likely to TRY HARDER to stop a Genocide, than most doctors or bureaucrats would try.